Carey High School’s eight-man football team kept rolling along Friday night, although lightning strikes ended its Sawtooth Conference West Division game with Camas County of Fairfield at halftime. The unbeaten Panthers (5-0, 2-0 league) went into the league’s bye week with a 62-6 win over Camas County (0-5, 0-2). Carey out-gained Camas 494-227 in total yardage and recovered four fumbles. Carey senior quarterback Nate Adamson (391 all-purpose yards) rushed for three touchdowns and threw for three more TDs in just 24 minutes of action. Adamson was the game’s leading rusher with 111 yards. He threw for 146 more along with three conversions. Adamson also returned a fumble recovery for 94 yards to finish with four of Carey’s eight TDs. The Panthers (57.6 points per game) scored 48 points in the second quarter. They’ve now scored eight, nine, eight and eight TDs in the last four games, all wins. Junior receiver Joe Parke caught two TD passes for 118 yards. Junior Dallin Dilworth tallied his first TD on an 18-yard Adamson pass and led the Panthers with five tackles. Chris Peck, a senior, made a safety, and sophomore Parker Gamino finished the scoring with a four-yard TD pass from sophomore Toby Whitworth. Leading Camas County was Erick Peterson, who scored the first touchdown of Friday’s game on a 17-yard run. Peterson rushed 11 times for 29 yards, completed 5-of-6 passes for 138 yards including a 60-yard toss, and made 9 tackles to lead the Musher defense. Friday’s result, combined with Castleford’s 60-52 win at Dietrich, left Carey and Lighthouse Christian Academy of Twin Falls (5-0, 2-0) atop the six-team West Division with three games left. Carey’s next game is Oct. 10 at Dietrich (3-2, 0-2 league). Although the Blue Devils haven’t won in the division, they’ve played the top two teams, also losing 47-20 at Lighthouse Sept. 19. It’s possible that Dietrich could win out and finish 3-2 in league play. Meanwhile, Carey has the toughest part of its schedule ahead—traveling to Dietrich Oct. 10 and to another first-place contender, Castleford (4-1, 2-0), Oct. 17. And Castleford is very tough at home, going 21-3 at home from 2009-12. Carey’s final regular-season game is Oct. 24 at home with Lighthouse. After that, the four Sawtooth Conference West qualifiers for the Nov. 1 state play-in games will be established. That means Carey, Lighthouse, Dietrich and Castleford will likely be shooting for No. 1 through No. 4 seeds. INDIVIDUAL LEADERS—Carey Rushing—Nate Adamson 7-111 (15.9 yards per carry), 3 TDs, 1 conv. ; Parker Gamino 4-25; Zach Olsen 7-18, 1 TD; Matt Whitworth 2-18, 1 TD; Corban Johnson 3-16; Passing—Nate Adamson 4-5, 146 yards, 3 TD, 3 conv. ; Toby Whitworth 1-1, 4 yards, 1 TD. Receiving—Joe Parke 2-118, 2 TD, 1 conv. ; Dallin Dilworth 2-28, 1 TD; Parker Gamino, 1-4, 1 TD, 1 conv. Kickoff returns—Zach Olsen 1-23; Nate Adamson 1-14. Punt returns—Nate Adamson 1-26. 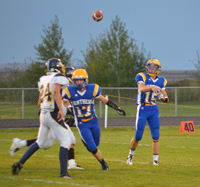 All-purpose yardage—Nate Adamson 391. Fumble recoveries (4)—Nate Adamson 1 with a 94-yard TD return; Chris Peck 1 with a 4-yard return; Alex Durtschi 1; Nik D’Orazio 1. Tackles/assists—Dallin Dilworth 5/0; Corban Johnson 4/0; Nik D’Orazio 1/4; Chris Peck 3/1; Alex Durtschi 2/1; Matt Whitworth 1/1; Derrick Baird 2/0; Parker Gamino 1/1; Nate Adamson 2/0; Zach Olsen 0/1. CAREY Line Score Carey 62, Camas County 6 CAMAS COUNTY 6 0 x x 6 CAREY 14 48 x x 62 1st half Camas County—Erick Peterson, 17-yard run (pass failed); (6-0 Camas). Carey—Nate Adamson, 70-yard run (run failed); (6-6). Carey—Nate Adamson, 5-yard run (Adamson run); (14-6 C). Carey—Joe Parke, 27-yard pass from Nate Adamson (Parke, pass from Adamson); (22-6 C). Carey—Dallin Dilworth, 18-yard pass from Nate Adamson (Zach Olsen run); (30-6 C). Carey—Joe Parke, 91-yard pass from Nate Adamson (Matt Whitworth run); (38-6 C). Carey—Nate Adamson, 5-yard run (Matt Whitworth, pass from Adamson); (46-6 C). Carey—Nate Adamson, 94-yard fumble return (Parker Gamino, pass from Nate Adamson); (54-6 C). Carey—Chris Peck, safety; (56-6 C). Carey—Parker Gamino, 4-yard pass from Toby Whitworth (no conversion); (62-6 C).